Looking for that perfect gift for your child? Look no further! This Mongoose Mini Bike is loads of fun! Not only is it easy to put together, it is tons of fun. The Mongoose 24 Volt Powered Mini Bike is one of the hottest toys of the season. Why should little kids have all the fun? This all new 24 Volt — rechargeable battery powered ride on mini scooter is a little package of fun for the bigger kids looking for some new thrills. 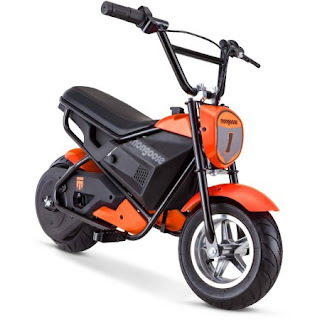 Recommended for one rider, ages eight plus, 120 pounds maximum; the Mongoose Powered mini bike can move up to 10 mph on low speed and up to 12 mph on high. There are tons of big features on this mini bike like the 250-watt chain driven motor, a rear wheel disk brake that is controlled on a lever on the right hand grip, air filled ten-inch diameter tires that are a chunky four inches wide, and a poly leather like stitched cushion seat. Plus, there is a kick stand, foldable foot rests, and ultra cool motorcycle styling with a Mongoose number plate up front. Riding is so much fun, the on switch is on the top of the bike and the high-low power switch is mounted under the seat. The rider controls the throttle on the right hand grip. Thanks to Mongoose for sending me this Mini Bike to review. What do you think about this mini bike from Mongoose? I have a grandson that is 10. I know he would love one. What a cool bike! I have a nephew that would freak over this. It is truly a fabulous gift idea. For the child who was born to be wild! I think my grandson who is 7 would just love it! Not really a fan of these. I would be afraid of injuries. WOW!! The kids would love this. My son, who is 7, would love it! I have a nephew that would absolutely love this! Whoa! That looks awesome! Both of my kids would freak over that! OMGoodness, How Fun! I haven't seen anything quite like this. My grand-girls would love it! Oh my gosh, this is so cute. My nephews would have a blast with this. My nephews have one similar to this & they love it. Of course, it's too cold to ride it right now, lol. I would ride this myself! lol! That looks like so much fun. With the weight limit I could ride it, too. I like the power behind it! Nice that it will hold up to a 120 pound child. My grandson would like this , however he isn't quite big enough yet. Wow so cool! A cool and unique gift. How cute, my grandson is in love with motorcycles. I bought him a toy one last year but he broke it short time. I wish they had these when I was growing up. I would have wante one! This would be a great gift for any kid. Oh I wish you were giving one of these away. These are just so much fun. I love it!! I'm going to have to look into getting one this spring from someone I know who will ride it! This bike is so cute. Any child would be happy to find this on Christmas morning!! This bike is adorable I bet it would be so much fun to have. My nephew would think he was a grown up motorcycle rockstar if he had this! These are so awesome! I have a grandboy who would love nothing more than to ride one of these around. My nephew would do back flips for this. Too cool. Wish I could ride it. That bike is the neatest bike in the whole wide world. Love the orange too! This would be a great gift for any child in the correct age range. Mini bikes are so much fun!!! We had them as kids, and we had a blast. Mind you a brother got a broken wrist, one got broken arm, there were 2 fractured collar bones, but gosh I will never forget the fun we had on those things! This bike would be a big hit in my house. All three of my kiddos would want a go on it! My boys you LOVE to have this. I wish I was smaller so I could ride on it! My nephew would love that! My niece is getting a power wheel for her birthday which is just after Christmas. I would be ideal for a boy specially for christmas. This is so adorable! My nephew would absolutely adore this! My grandson would love to have this. Oh my goodness, how neat! My son LOVES motorcycles! This would be a great present for him! He's only 5 though and I'm always nervous with things like this lol. I'd want him in total protective gear! This looks like so much fun! My grandkids would have a ball with it! Our kids would love this! Hubby will have to stay off of it though with the 120 pound limit!